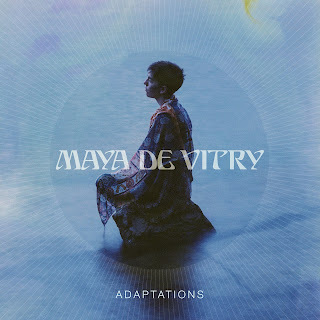 If music is a gift from artist to listener, then recipients of the new album from Maya de Vitry have a gilt-edged treat to unwrap and savour. When sad news of The Stray Birds calling it a day emerged in the latter part of last year, little did we realise that ADAPTIONS was right around the corner. Of course, The Stray Birds was a core trio of very fine roots musicians, but there was something extra special about Maya de Vitry’s role right at the heart of this combo. The route taken in this debut solo release in some respect is a major sound diversion, but there is a trademark feel that Maya has not left her roots behind, just expanded, evolved and emerged as a fuller bodied recording artist. These are roots branching out in a sophisticated direction, with electric guitar injecting a whole new realm of energy. Anthony da Costa, a much-revered guitarist in alt-folk/country circles, appears to be a key component in the revised sound, and his artistry has worked wonders with the deep reaching vocals of Maya de Vitry, ones that twist in a mournful moan ala Gillian Welch whilst sending shivers from head to toe in their ability to convey meaningful emotion. So, as folk morphs into folk rock, the twelve tracks that form the supreme entity that ADAPTIONS is destined to become roll out in a cyclical wave – all bound by a stunning lyrical complexity sharing the depth of a song writer’s soul. The circle completes by the soft tender tones of the first and last track. ‘Wilderness’ opens up in an atmospheric spell of minimalist splendour in direct unison with the tranquil tones of the tempered closer ‘You’. Tempo change stutters as the playing time unravels, peaking with two tunes that vie in the early stages as tracks to hang your hat on. ‘Slow Down’ features the vocals of Maya that we have come to love as they blend perfectly with a new sound slowly being captured. The pomposity of ‘Anyone At All’ makes it an understandable standout candidate and a strong message that Maya can mix it in populist circles. Two further familiar names joining in the fray see ex-Della Mae member Courtney Hartman lend vocals and co-writing skills to the hauntingly beautiful ‘What the Moon Said’, a random personified dip into the natural world. Ana Egge contributes to ‘Anybody’s Friend’ in a co-writing role as the positive tones of teaching morals takes root in a tune decorated with the most lovely of hooks. ‘The Key’ and ‘This Side of a Dream’ may exist a fair distant apart in the track listings, but both are intrinsically linked by their soothing and sultry feel. In moments like these, diving into the lyrics is a recommended listening companion. Attached to the press copy were some detailed thoughts on each song by Maya, but sometimes it is just as satisfying to digest understanding on your own terms and let the lyrics take the song wherever you want to be guided. Like many satisfying records, this release shares the workload. In parts, it will do the work, but requires the listener to chip in with some endeavor from time to time. No hardship if you want to get the best out of a record. Back to the tracks, and the delights of ‘My Body is a Letter’, a song that does possess some remnants of a Stray Birds feel to it. ‘How Do I Get to the Morning’ is an olive branch track containing a roots infused inner with a groovy beat before hitting the rails with a rocky outtake. ‘When Memories Come Around’ is a crowning gem of how this album blends stirring guitar work with a stunning voice, which just leaves ‘Go Tell a Bird’ to bring up the rails. This final track has persistently drew a blank in inspiring comment, but perhaps is symptomatic that this album is one for the long haul and maybe an indicator that there is still much to be discovered long after release date and the dying down of formal reviews. Full kudos to Maya de Vitry for curating a debut album that induces endless hyperbole. Subtle, permeative, sensual and compulsive are just four words that describe ADAPTIONS. An early opportunity to grasp this supremely textured album has been gratefully enjoyed and happily drowning in a deep vault of probing and visionary song writing ensures unabated approval is offered from these quarters.